Okay so I missed yesterdays blogmas post – I apologise, the winter lighting was not in my favour. I may miss a few more days due to being busy and the lighting, but I’m trying my best to get one up everyday! So I hope you enjoy todays! Starting off with a goodie. I haven’t heard many people talk about the colour rush balm’s but they should be spoken about much more, they’re so good. This is more of a pinky red, and looks stunning on the lips. It stays put for ages and dries to a semi matte I’d say. This would be perfect if you were going out for a Christmas party! Who hasn’t heard about Russian Red? One of the best reds I own. A gorgeous cool toned red in a matte formula. This doesn’t dry out my lips either which is such a bonus. It stays put, with no smudging anywhere. Its a lovely day time red, and could easily be pulled off if you were going out in the evening with a gold smoky eye. If you buy any lip product from this post I’d highly recommend this one! I actually spoke about this back last year when I did a very similar post to this. I love Tanya’s range and everything is so pretty. This is in between a cool toned and warm toned red I’d say. Its perfect to wear on a day out, as its not too sticky nor will it smudge. You may need to reapply a few times after food and drink but you usually have to with most lip glosses. I think this is such a beautiful shiny red that is perfect for the festive season! I honestly love this lipstick (I know I’ve said that about all of these here oops) but its so gorgeous. The main reason I love it is because its so wearable. If you think that you don’t suit reds, I promise you, this will suit you. Its a warm toned red again and slightly on the pinky side. But its just stunning. It feels extremely comfortable on the lips which is the best part. It dries to a satin finish I’d say, not quite matte. So no dry lips (yay)! I’d really recommend picking this up if you have the spare £16 haha. 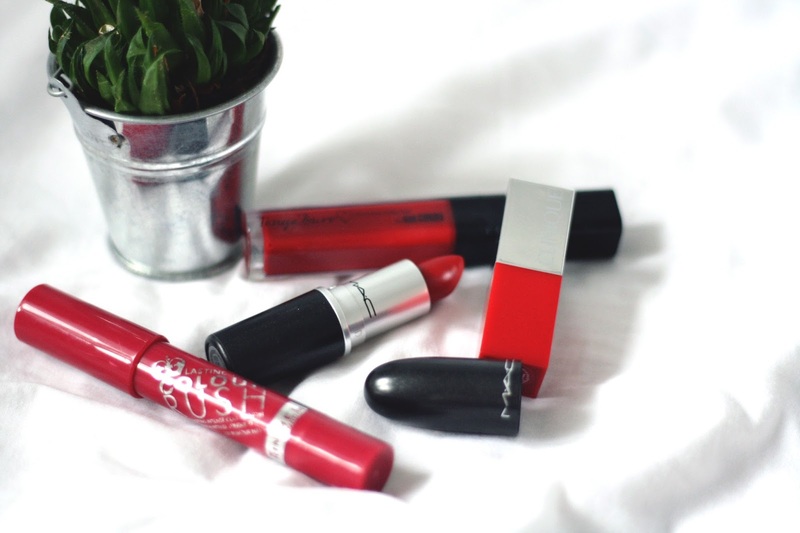 Whats you favourite red lip colour?